Jiang Z., et al. The Relationship between Expression of HS3ST2 and the Invasiveness in Growth Hormone Adenomas. (2018) Int J Neurol Brain Dis 5(1): 15- 21. © 2018 Jiang Z. This is an Open access article distributed under the terms of Creative Commons Attribution 4.0 International License. Background: Growth hormone pituity adenomas account for about 10% - 15% of all benign pituitary tumors ,over-secreted growth hormone leads to acromegaly, significantly increased incidence of respiratory, cardiovascular and malignant tumors, severely affected people’s health. But the pathogenesis of GH adenomas is complex, it is not completely understood so far. Gene HS3ST2 is one kind of sulfonyl transferase, which is inactivated by hypermethylation of the gene in most tumors. However, the expression and role of the gene HS3ST2 in pituitary adenomas have not been reported in the literature. It was found that the gene was highly expressed in GH adenoma and interacted with WNT pathway and ECM- receptor. Therefore, gene HS3ST2 may be the key gene for the occurrence and development of GH adenoma. The purpose of this study was to investigate the difference of gene HS3ST2 expression between invasive and noninvasive growth hormone pituitary adenomas, to explore the role of the gene in GH adenomas. Methods: Collected specimens of normal pituitary tissues (n = 3), and invasive and non invasive pituitary growth hormone adenoma (n = 6 in each group), according to the inclusion and exclusion criteria, the application of RT-qPCR method and Western Blot to detect the expression of gene HS3ST2 between normal pituitary tissues group and GH adenoma group. Results: The level of gene HS3ST2 expression in GH adenomas (non-invasive and invasive) and normal pituity tissues is different. We found that the expression of HS3ST2 in tumor tissues was higher than that in normal pituitary tissues (P < 0.05), and the expression in noninvasive growth hormone pituitary adenomas was higher than that in invasive GH pituitary adenomas (P < 0.05). Conclusion: Gene HS3ST2 may be related to the pathogenesis of growth hormone pituitary adenoma, but to some extent, We are not sure that the gene HS3ST2 is the key gene to promote the invasiveness of GH adenoma. Further research is needed on the pathogenesis of GH adenoma and the factors related to its invasiveness. GH adenomas account for about 10% - 15% of all benign pituitary tumors. Its incidence is second only to the prolactinomas. GH adenomas secrete excessive growth hormone, which causes acromegaly in adults, and before puberty, the patients with unfused epiphysis present as gigantism. The most common cause of acromegaly is the growth hormone pituity adenomas by excessive GH secretion. Continued secretion of GH may affect the cardiovascular system, leading to such conditions increased as hypertension, cardiomyopathy, valvular heart disease, and premature death[4,5]. Reports have shown that acromegaly can significantly increase the incidence of respiratory disease and therioma[6-8]. Some retrospective studies have shown that the mortality of acromegalyis at least twice as high as in normal people. Surgical resection is the preferred treatment for GH pituitary adenoma. There are transsphenoidal and transcranial surgery. Butterflies are divided into endoscopic transsphenoidal and microscopical transsphenoidal. In general, surgery can only enable 50% patients to reach the clinical level and biochemical remission. Giant or invasive GH adenoma is more difficult to treat. The incidence of tumor invasion into the cavernous sinus is likely to be greater than 10%, for which combination drug therapy or radiotherapy. For GH adenoma, some scholars believed that in some cases, medication can be used as the first choice for the treatment of GH adenomas. Generally, medical therapies grouped into three classes: somatostatin receptor analogues, dopamine agonists (DA) and GH receptor antagonists. However, drug therapy requires long-term medication and the price is expensive. For GH adenomas invading cavernous sinus, the radiotherapy effect was poor in both tumor reduction and biological remission rate. In summary, although the GH adenomas are benign tumors, the result of treatment is still not optimistic. Therefore, it is significant to deeply study the pathogenesis of GH adenomas. E2F, MEG3, PRKAR1A, AIP are involved in the occurrence and development of pituitary GH adenomas[13,14], but the tumorigenesis is far from fully understood. Our previous study found that the expression of gene HS3ST2 in GH adenomas was up to 99.8 times, and it has obvious correlation with WNT pathway and ECM- receptor. This study will continue to study the mechanism of the gene in GH adenomas. Gene HS3ST2 is located on chromosome 16, also as known as 3OST2, it is a 367-amino acid single-channel type II membrane protein, located in Golgi complex, belonging to the heparin sulfate biosynthesis family, encoding heparin sulfate glucosamine glucose-3-oxy-sulfonyltransferase 2. This enzyme participates in the final modification in the biosynthesis of heparin sulfate, and this modification is very important. Because this modification determines the specificity of heparin sulfate proteoglycan (HSPG) binding to different proteins, which determines the regulation characteristics of HSPGs. HSPGs are proteins containing highly sulfated mucopolysaccharide (gag) chain, that present in all human cells and tissues, and its functions are associated with growth factor, tyrosine kinase receptor, matrix metalloprotein, extracellular matrix protein interaction, regulating cell adhesion, proliferation and movement[18-21]. HSPGs not only regulate physiological processes such as organ formation, angiogenesis, blood coagulation and fat metabolism, but also participate in the formation and progress of tumors. The expression and structure of HSPGs in tumors are different from those in normal tissues, therefore, the HS-dependent cellular processes in tumors are often dysfunctional. HSPGs provides binding sites for growth and chemokines, which in turn cause growth and chemokines to form solid ternary complexes with their respective receptors, thus facilitating cellular signal transduction. The best example is that the growth factor-HS interaction is bound to the GAG strand of HSPGs through FGFs to ensure the correct signal transduction. And HSPG regulates multiple signaling pathways[23,24]. Recent studies have found that HS3ST2 is hypermethylated in many tumors, such as mammary cancer, colon carcinoma[26,27], gastriccancer, bladder cancer, and cervical carcinoma. However, HS3ST2 hypermethylation may indicate the invasiveness of the tumor in cervical cancer. The gene HS3ST2 may be a key gene in the pathogenesis of pituitary GH adenomas. It is of great significance for the final treatment of this disease. The clinical data of 12 cases of growth hormone type pituitary adenoma were retrospectively analyzed from January 1st 2016 to June 30th 2017. All patients were underwent transsphenoidal resection of pituitary adenoma at Bengbu first affiliated Hospital, Bengbu Medical College, Anhui Province, China. All specimens were obtained in compliance with the Helsinki Declaration and approved by the local ethics committee. The tumor tissues were sent to the department of pathology after operation, and the pathological results confirmed growth hormone pituitary adenoma. In addition, normal pituitary tissues were taken from the anterior lobe of donor within half an hour of death. After all specimens taken, then immediately put into the RNA extract and frozen in liquid nitrogen. We obtained data of targeted tumor specimens for this study from the health information system (HIS) in our hospital. They were 8 women and 4 men. The age was 21- 65 years (mean 47 ± 11. 31). The tumor size was measured with a maximum diameter on coronal images of MRI scans. Inclusion criteria of noninvasive GH adenomas (n = 6): Selected cases must meet the following requirements: 2, 4 must meet at least one compliance, with or without 1. 2) Imaging: MRI enhancement images confirmed pituitary adenoma. 3) Endocrine function test: OGTT: Nadir GH > 1 μ g / L ;Insulin-like growth factor-1 (IGF-1) was higher than normal; GH > 2 μ g / L.
4) GH adenoma was diagnosed by immunohistochemistry. 1) CT showed the tumor invading sious cavernosus (Hardy’s classification of 3 ~ 4 grade pituitary adenoma). 3) Invasion of cavernous sinus, dura and bone were observed during the operation. The tumor tissues were preserved at -80°C before RNA extraction.RNA was extracted from each adenoma tissue measured about 3 ± 0.5 mg. The concentration of RNA extracted was determined by ultramicro spectrophotometer (NanoDrop2000, Thermo, USA). 2 μ g RNA was used as raw material, the first strand-c DNA was formed by reverse transcription after removing the contaminated genome. Reverse transcription by PCR kit (Thermo Fisher Scientific, USA ) containing 1 ml 10XRT buffer, 1 ml 10X Random Primers, 0.2 ml 25XdNTP Mix (100 mM), 0.2 ml MultiScribe ®Reverse Transcriptase (50U/μL). The reaction mixture was heated at 25 °C for 10 min, at 37 °C for 120 min, and then in the thermal circulator for 5 minutes at 85 °C (MBI Fermentas, Canada). Then cooled on the ice for 5 minutes. Quantitative real-time PCR was progressed duplicated on an ABI7500 system using Gene Expression Master Mix (Applied Biosystems) for SYBR green PCR master mix (Takara, Shiga, Japan) according to the manufacturer’s protocol. The primer sequences designed for cDNA amplification are as follows (forward and reverse,5‘-3‘):F : 5′-TAA GCG ATG ATG GTT CTG TTG C-3′;R:GAA ATG AAG CTC AGA GGG AAG A-3′ (Beijing Liuhe Huada Gene Technology Co., Ltd., China). The conditions of polymerase chain reaction were: 94 °C for 3 min, then 94°C for 45 s, 60°C for 50s, 72°C for 30 s, for a total of 40 cycles, and at last extended at72°C for 7min. The expression of HS3ST2 mRNA in GH pituitary adenomas was measured by real-time PCR assay. The relative amount of the PCR expression was calculated as the threshold cycle: CT value (Applied Biosystems, Tokyo, Japan). Relative gene level was described by the ΔΔCt method. Relative mRNA amount was expressed as 2-ΔΔCt. Each PCR experiment was performed PCR tests were performed with specimens intriplicate and repeated at least once. The internal control was used by glyceraldehyde 3-phosphate dehydrogenase (GAPDH) . The tumor tissue was preserved at -80 °C until the protein was extracted. 20 ± 5 mg of tumor tissue was used to extract the tissue proteins. 50X protease inhibitor, 100X phosphatase inhibitor, the non-denaturing protease inhibitor were used to prepare the tissue protein lysate (Beijing Pulitzer company, China). The tissue was crushed as fully as possible and was mixed with the lytic solution. After 30 minutes of cracking on the ice, the pyrolysis fluid was respectively transferred to a 1.5 ml centrifuge tube. After centrifugation at 12 000 r/min, 4 °C for 10 minutes, the supernatant was packed in 0.5ml centrifuge tube and stored at -20 °C. The content of protein was determined by Coomassie brilliant blue G-250 and the protein concentration of each group in 96 well plate was determined by the multifunctional enzyme marker (Infinite 200PRO,TECAN,Switzerland ). According to the molecular weight of the gene HS3ST2 (42kDa Abcaman China), 10% separation gel, 5% spacer gel were prepared. Calculating the volume of solution containing 30mg protein as the amount of sample. After adding enough electrophoretic solution, running for 45min at 60V electric quantity to the junction of separation gel and spacer gel, and constant voltage changed to 120V running for 2 hours until bromophenol blue runs out then the electrophoresis was finished. Then the nitrocellulose membrane was transferred to the membrane and the constant current of 100 mA was used for 3 hours. Take out PVDF membrane, wash it cleanly and prepare 5% BSA as sealing fluid for 4 °C overnight. The rabbit polyclonal antibody HS3ST2, the first antibody, was prepared with 5% BSA and its concentration was 1: 800. The membrane washed with TBST at room temperature in decolorized shaking bed for 3 times, 10 minutes. The second antibody was then incubated and marked through the horse radish peroxidase at room temperature for 1 hour. The second antibody was anti-rabbit IgG (1: 8 000). Then the membrane washed with TBST at room temperature in decolorized shaking bed for 3 times, 10 minutes. Detection with ECL Chemiluminescence Reagent (ECL, Amersham Corp), and immunoreactive bands were quantified using Image Quant (Bio-Rad). Glyceraldehyde 3-phosphate dehydrogenase (GAPDH) was used as the internal control. All experiments were performed at least three times, and data was analyzed by using SPSS23.0 (SPSS Inc., Chicago, IL, USA). Data was presented by the mean ± SEM. 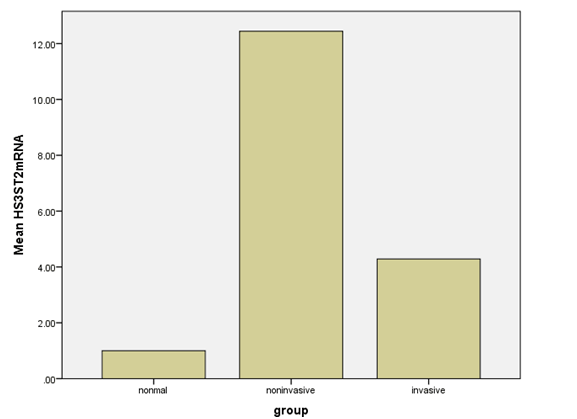 T-test was used to express statistical difference between different groups , P < 0.05 was considered statistically significant. HS3ST2 was expressed in all examined growth hormone pituitary adenomas; the mean expression level of HS3ST2 mRNA in noninvasive GH adenomas was 12.44 ± 1.62; and the mean expression level of mRNA HS3ST2 mRNA in invasive GH adenomas was 4.29 ± 0.32 (Table 1). There was an significant difference of HS3ST3 expression in the noninvasive GH adenomas and invasive GH adenomas (p < 0.05). There was no significant correlation between HS3ST2 expression and patients′age, gender, and tumor size (Table 2). However, The expression of HS3ST2 in tumor tissues was higher than that in normal pituitary tissues (P < 0.05)(Figure 1), and the expression in noninvasive growth hormone pituitary adenomas was higher than that in invasive GH pituitary adenomas (P < 0.05)(Figure 1). Table 1: HS3ST2 mRNA in different groups. Table 2: Gender, Tumor size, Age in noninvasive and invasive GH adenomas. All examined GH pituitary adenomas expressed HS3ST2 (Figure 2). The protein level of HS3ST2 obviously higher in noninvasive GH pituity adenomas group compared to the invasive GH pituity adenomas group. Compared to tumor groups, the express of HS3ST2 in normal pituity tissue was apparently lower. Glyceraldehyde 3-phosphate dehydrogenase (GAPDH) was used as the internal control (Figure 3). Figure 3: GAPDH (internal control). In general, we have reasons to considerate that gene HS3ST2 may be related to the pathogenesis of growth hormone pituitary adenoma, but to some extent, we are uncertain that the gene HS3ST2 is the key gene to promote the invasiveness of GH adenoma; it may play a role as a tumor suppressor gene in terms of invasiveness. There are still exiting limitations in our study. On the one hand, the sample capacity is not enough, data results may be biased. On the other hand, we only have studied a signal gene pathway, and we have not explored the level of HS3ST2 expression in patients’ blood at preoperative and postoperative. Therefore, further research is needed on the pathogenesis of GH adenoma and the factors related to its invasiveness. In addition, there is still a long way to investigate the pathogenesis of growth hormone pituitary adenomas. Growth hormone pituitary adenoma is a benign tumor originating from anterior pituitary cells, with an incidence of about 10% - 15% in all types of pituitary adenomas. More than 65% are giant adenomas with clinical symptoms of headache, visual impairment, and hypophysis. Excessive secretion of growth hormone is the main cause of acromegaly in adults. Petrossians P, et al. had performed a study with a population of 3173 acromegaly patients from ten countries; 54.5% were female. Females were significantly older at diagnosis than males (46.4 vs 43.5years). Patients with GH adenomas, often accompanied with complications from the cardiovascular system, endocrine system, and even the respiratory system, which lead serious threats to reduce human quality of life and their life expectancy. However, the early symptoms of growth hormone pituitary adenomas are not obvious. The early diagnosis faces a great challenge. And clinically silent somatotroph adenomas are common. Syro LV, et al. Proposed that a society will be built ,consisting of more well-informed patients, astonishing technological advances and easy internet access, novel ways of improving early diagnosis of acromegaly should be implemented. Clinically, we usually combine the patient’s clinical manifestations, laboratory findings, imaging findings, and pathological findings to make the final diagnosis. There are two major methods for classification of invasive pituitary adenomas, one is Knosp classification: the relationship between pituitary adenoma and cavernous sinus was determined by measuring the vascular diameters of pituitary adenoma and cavernous sinus segment of the internal carotid artery (C4) and the superior segment of the mastoid process (C2) in coronal position of cavernous sinus (MRI). The other is the Hardy’s classification: according to CT findings, the modified Hardy’s grades was classified into 5 grades: grade 1: pituitary microadenoma; grade 2: pituitary adenoma with or without sella sellae invasion, and sella turcica enlarged, sellar floor is normal ;grade 3: focal erosion or destruction of sellar floor; grade 4: diffuse erosion of sellar floor ;grade 5: tumor spreading along cerebrospinal fluid or blood. Generally, grade 3 and grade 4 were considered to be invasive. In our study, the modified Hardy’s grades were used as invasive criteria .The invasive pituitary adenomas are characterized by larger tumor size, more difficult complete resection and easier recurrence. Treatments include drug therapy, surgical treatment and radiation therapy. And in most cases, surgery is the first choice. There are two surgical methods, including endoscopic and microscopic transsphenoidal pituitary surgery. The pathogenesis of the invasive growth hormone pituitary adenomas is unclear. Therefore, this study intends to explore the pathogenesis of invasive GH adenomas from the perspective of gene, so as to find out the gene target for the treatment of growth hormone type pituitary adenoma. It has been reported that AIP mutation may be related to the family heredity of GH adenomas. Alimohamadi M et al. had designed a research scheme to investigate the long-term effects of immunohistochemical staining of Ki-67 and p53 on the surgical treatment of growth hormone GH secretory pituitary adenomas. During follow-up, p53 and Ki-67 were significantly increased in invasive patients (cavernous sinus and suprasellar infiltration). It has also been reported that STAT3 upregulation in GH adenomas can lead growth hormone hypersecretion. The gene HS3ST2 is a 367-amino acid single-channel type II membrane protein, belonging to the heparin sulfate biosynthesis family. As we know, the function of HS3ST2 is to regulate cell adhesion, proliferation and movement. Recent studies have found that HS3ST2 is hypermethylated in many tumors and may predict poor overall prognosis. However, the role of gene HS3ST2 in growth hormone pituitary adenomas has not been reported so far. At first, we also thought that the high expression of HS3ST2 in growth hormone pituitary adenomas was positively correlated with invasiveness, but in our study, we found the opposite results. In this study, we detected HS3ST2 mRNA by RT-qPCR and protein by Western blot in invasive and noninvasive GH adenomas, and human normal pituitary glands. The study showed that the expression of HS3ST2 in tumor tissues was higher than that in normal pituitary tissues (P < 0.05). There was an significant difference of HS3ST3 mRNA expression in the noninvasive GH adenomas and invasive GH adenomas (P < 0.05). The protein level of HS3ST2 obviously higher in noninvasive GH pituity adenomas group. Compared to tumor groups, the express of HS3ST2 in normal pituity tissue was apparently lower (P < 0.05). Therefore, we believe that HS3ST2 promotes the development of growth hormone pituitary adenoma, but it may be a tumor suppressor gene, which is not closely related to invasiveness. Hwang J-A et al. have reported that HS3ST2 is a tumor suppressor gene and may be a good prognostic marker in patients with NSCLC. They found that HS3ST2 hypermethylation may be an independent prognostic marker for the overall survival of patients with lymphaden-negative I- II NSCLC.This is in line with our results. Thacker BE et al. Studied that through 3-O- sulfation, especially HS3ST2, enhanced endothelial cell growth inhibition. This suggests that sulfate plays an important role in the expression of HS3ST2 biological activity. Gene HS3ST2 is involved in the final modification of heparin sulfate biosynthesis, which determines the specificity of different proteins binding to heparin sulfate proteoglycan (HSPGs).HSPGs plays an important role in the formation of specific synaptic connection patterns, which play an important role in neural circuit function, and their dysfunction may be related to the development of brain dysfunction. Moreover, HSPGs regulate a variety of genes, including HS3ST2, and have profound effects on cell, tissue and tissue levels. The study of the relationship between HS3ST2 and the invasiveness in GH adenomas can not only explore the pathogenesis of GH adenomas, but also provide a target for gene therapy of GH adenomas. It is of great theoretical and practical significance. However, the role of HSPGs in regulating the role of gene HS3ST2 in GH adenomas has not been reported, and the relationship between gene HS3ST2 and the invasiveness of GH adenomas has not been well understood. No study has been done on whether invasiveness is related to secretory hormones, and the role of gene HS3ST2 in invasive GH adenomas needs further study. In order to clarify the role of gene of HS3ST2 in GH adenomas and its relationship with invasiveness, more in-depth research needs to be explored. Gene HS3ST2 may be related to the pathogenesis of growth hormone pituitary adenoma, but to some extent, we are not sure that the gene HS3ST2 is the key gene to promote the invasiveness of GH adenoma. Further research is needed on the pathogenesis of GH adenoma and the factors related to its invasiveness. Acknowledgments: I would like to express my sincere gratitude to my supervisor, Dr. Zhiquan Jiang, a responsible, knowledgeable, responsible scholar, who has provided me with valuable guidance in every stage of writing this thesis. And I also would like to show my heartful gratitude to my helper Yinglei DU,JC Fang, Song Bai, Nan Li, Jiwei Sun, who are kind and experienced, without their assistance, I could not complete my thesis. Their keen and rigious academic style will benefit me not only in this thesis, but also in my further study. 1. Syro, L.V., Rotondo, F., Ramirez, A., et al. Progress in the Diagnosis and Classification of Pituitary Adenomas. (2015) Front Endocrinol (Lausanne) 6: 97. 2. Rhee, N., Jeong, K., Yang, E.M., et al. Gigantism caused by growth hormone secreting pituitary adenoma. (2014) Ann Pediatr Endocrinol Metab 19(2): 96-99. 3. Abreu, A., Tovar, A.P., Castellanos, R., et al. Challenges in the diagnosis and management of acromegaly: a focus on comorbidities. (2016) Pituitary 19(4): 448-457. 4. Ntali, G., Karavitaki, N. Recent advances in the management of acromegaly. F1000Research.2015;4:F1000 Faculty Rev-1426. 5. Găloiu, S., Poiană, C. Current therapies and mortality in acromegaly. (2015) J Med Life 8(4): 411-415. 6. Lugo, G., Pena, L., Cordido, F. Clinical Manifestations and Diagnosis of Acromegaly. (2012) Int J Endocrinol 2012: 540398. 7. Chanson, P., Salenave, S. Acromegaly. (2008) Orphanet J Rare Dis 3: 17. 8. Rokkas, T., Pistiolas, D., Sechopoulos, P., et al. Risk of colorectal neoplasm in patients with acromegaly: A meta-analysis. (2008) World J Gastroenterol 14(22): 3484-3489. 9. Beauregard, C., Truong, U., Hardy, J., et al. Long-term outcome and mortality after transsphenoidal adenomectomy for acromegaly. (2003) Clin Endocrinol (Oxf) 58(1): 86-91. 10. Guinto, G., Abdo, M., Zepeda, E., et al. Acromegaly: role of surgery in the therapeutic armamentarium. (2012) Int J Endocrinol 2012: 306094. 11. Ceylan, S., Koc, K., Anik, I. Endoscopic endonasal transsphenoidal approach for pituitary adenomas invading the cavernous sinus. (2010) J Neurosurg 112(1): 99-107. 12. Plöckinger, U. Medical Therapy of Acromegaly. (2012) Int J Endocrinol 2012: 268957. 13. Melmed, S. Acromegaly pathogenesis and treatment. (2009) J Clin Invest 119(11): 3189-3202. 14. Xekouki, P., Azevedo, M., Stratakis, C.A. Anterior pituitary adenomas: inherited syndromes, novel genes and molecular pathways. (2010) Expert Rev Endocrinol Metab 5(5): 697-709. 15. Rostad, S. Pituitary adenoma pathogenesis: an update. (2012) Curr Opin Endocrinol Diabetes Obes 19(4): 322-327. 16. Jiang, Z., Gui, S., Zhang, Y. Analysis of differential gene expression by bead-based fiber optic array in growth-hormone-secreting pituitary adenomas. (2010) Exp Ther Med 1(5): 905-910. 17. Hwang, J.A., Kim, Y., Hong, S.H., et al. Epigenetic inactivation of heparan sulfate (glucosamine) 3-O-sulfotransferase 2 in lung cancer and its role in tumorigenesis. (2013) Plos One 8(11): e79634. 18. Yip, G.W., Smollich, M., Gotte, M. Therapeutic value of glycosamino glycans in cancer. (2006) Mol Cancer Ther 5(9): 2139-2148. 19. Afratis, N., Gialeli, C., Nikitovic, D., et al. Glycosamino glycans: key players in cancer cell biology and treatment. (2012) FEBS J 279(7): 1177-1197. 20. Nikolova, V., Koo, C.Y., Ibrahim, S.A., et al. Differential roles for membrane-bound and soluble syndecan-1 (CD138) in breast cancer progression. (2009) Carcinogenesis 30(3): 397-407. 21. Meneghetti, M. C., Hughes, A.J., Rudd, T.R., et al. Heparan sulfate and heparin interactions with proteins. (2015) J R Soc Interface 12(110): 589. 22. Vijaya, K.A., Salem, G.E., Spillmann, D., et al. HS3ST2 modulates breast cancer cell invasiveness via MAP kinaseand Tcf4 (Tcf7l2)-dependent regulation of protease and cadherin expression. (2014) Int J Cancer 135(11): 2579-2592. 23. Hassan, H., Greve, B., Pavao, M.S., et al. Syndecan-1 modulates beta-integrin-dependent and interleukin-6-dependent functions in breast cancer cell adhesion, migration, and resistance to irradiation. (2013) FEBS J 280(10): 2216-2227. 24. Beauvais, D.M., Ell, B.J., Mcwhorter, A.R., et al. Syndecan-1 regulates alphavbeta3 and alphavbeta5 integrin activation during angiogenesis and is blocked by synstatin, a novel peptide inhibito. (2009) J Exp Med 206(3): 691-705. 25. Dietrich, D., Lesche, R., Tetzner, R., et al. Analysis of DNA methylation of multiple genes in microdissected cells from formalin-fixed and paraffin-embedded tissues. (2009) J Histochem Cytochem 57(5): 477-489. 26. Gonzalo, V., Lozano, J.J., Munoz, J., et al. Aberrant gene promoter methylation associated with sporadic multiple colorectal cancer. (2010) PLoS One 5(1): e8777. 27. Tokuyama, Y., Takahashi, T., Okumura, N., et al. Aberrant methylation of heparan sulfate glucosamine 3-O-sulfotransferase 2 genes as a biomarker in colorectal cancer. (2010) Anticancer Res 30(12): 4811-4818. 28. Bernal, C., Aguayo, F., Villarroel, C., et al. Reprimo as a potential biomarker for early detection in gastric cancer. (2008) Clin Cancer Res 14(19): 6264-6269. 29. Roperch, J-P., Grandchamp, B., Desgrandchamps, F., et al. Promoter hypermethylation of HS3ST2, SEPTIN9 and SLIT2 combined with FGFR3 mutations as a sensitive/specific urinary assay for diagnosis and surveillance in patients with low or high-risk non-muscle-invasive bladder cancer. (2016) BMC Cancer 16(1): 704. 30. Lim, E.H., Ng, S.L., Li, J.L., et al. Cervical dysplasia: assessing methylation status (Methylight) of CCNA1, DAPK1, HS3ST2, PAX1 and TFPI2 to improve diagnostic accuracy. (2010) Gynecol Oncol 119(2): 225-231. 31. Zuo, Q., Zheng, W., Zhang, J., et al. Methylation in the promoters of HS3ST2 and CCNA1 genes is associated with cervical cancer in Uygur women in Xinjiang. (2014) Int J Biol Markers 29(4): e354-e362. 32. Hamid, O., El Hakim, A., El Husseiny, H., et al. Craniocaudal Extension as an Indication of Surgical Outcome in Transsphenoidal Surgery for Pituitary Adenomas. (2013) Ind J Otolaryngol Head Neck Surg 65(Suppl 2): 231-235. 33. Dai, C., Feng, M., Liu, X., et al. Refractory pituitary adenoma: a novel classification for pituitary tumors. (2016) Oncotarget 7(50): 83657-83668. 34. Kiseljak-Vassiliades, K., Carlson, N.E., Borges, M.T., et al. Growth Hormone Tumor Histological Subtypes Predict Response to Surgical and Medical Therapy. (2015) Endocrine 49(1): 231-241. 35. Petrossians, P., Daly, A.F., Natchev, E., et al. Acromegaly at diagnosis in 3173 patients from the Liège Acromegaly Survey (LAS) Database. (2017) Endocr Relat Cancer 24(10): 505-518. 36. Brue, T., Castinetti, F. The risks of overlooking the diagnosis of secreting pituitary adenomas. (2016) Orphanet J Rare Dis 11(1): 135. 37. Wade, A.N., Baccon, J., Grady, M.S., et al. Clinically silent somatotroph adenomas are common. (2011) Eur J Endocrinol 165(1): 39-44. 38. Samuels, M.H. Advances in diagnosing and managing pituitary adenomas. (1995) Western J Med 162(4): 371-373. 39. Knosp, E., Steiner, E., Kitz, K., et al. Pituitary adenomas with invasion of the cavernous sinus space: a magnetic resonance imaging classification compared with surgical findings. (1993) Neurosurgery 33(4): 610-617; discussion 617-618. 40. Theodros, D., Patel, M., Ruzevick, J., et al. Pituitary adenomas: historical perspective, surgical management and future directions. (2015) CNS Oncol 4(6): 411-429. 41. Gadelha, M.R., Kasuki, L., Korbonits, M. The genetic background of acromegaly. (2017) Pituitary 20(1): 10-21. 42. Alimohamadi, M., Ownagh, V., Mahouzi, L., et al. The impact of immunohistochemical markers of Ki-67 and p53 on the long-term outcome of growth hormone-secreting pituitary adenomas: A cohort study. (2014) Asian J Neurosurg 9(3): 130-136. 43. Zhou, C., Jiao, Y., Wang, R., et al. STAT3 upregulation in pituitary somatotroph adenomas induces growth hormone hypersecretion. (2015) J Clin Invest 125(4): 1692-1702. 44. Thacker, B.E., Seamen, E., Lawrence, R., et al. Expanding the 3-O-Sulfate Proteome—Enhanced Binding of Neuropilin-1 to 3-O-Sulfated Heparan Sulfate Modulates Its Activity. (2016) ACS Chem Biol 11(4): 971-980. 45. Condomitti, G., de Wit, J. Heparan Sulfate Proteoglycans as Emerging Players in Synaptic Specificity. (2018) Front Mol Neurosci 11: 14. 46. Sarrazin, S., Lamanna, W.C., Esko, J.D. Heparan Sulfate Proteoglycans. (2011) Cold Spring Harb Perspect Biol 3(7): a004952.